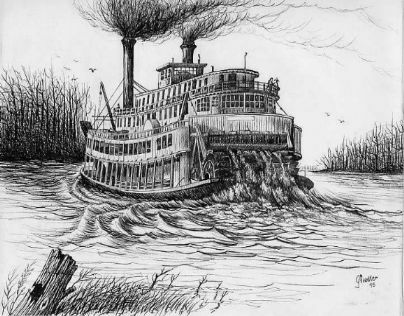 At 4 a.m. on April 24, 1882, the stern-wheel steamboat City Of Sanford burned to the waterline off Point la Vista within sight of downtown Jacksonville. Nine burned and battered bodies were recovered after what the Florida Daily Times newspaper – a forerunner of the Florida Times-Union -- called “One of the most shocking catastrophes that has ever happened on the St. Johns”. The water was only three feet deep at the wreck site and survivors were able to wade to dry land which was only 60 away from where the ship ran aground. “There was no necessity of anyone drowning in three feet of water,” said William H. Roberts, the Sanford’s captain. A coroner’s inquest investigating the tragedy the following week revealed the horrible way victims died. Crowds clustered at the Times office at Bay and Ocean streets, and fights broke out between men anxious to read the headlines: Shocking Calamity… Women & Children Roasted To Death… Stories of Terror and Despair. In the 1880s more paddlewheelers plied the St. Johns River than any other river south of the Hudson. Passengers, crammed aboard the riverboats, could speed along the St. Johns at up to 15 miles per hour. Competing steamer lines vied for business. Companies extolled their own boats as floating palaces sporting Italian musicians or steam calliopes that tooted Where, Oh Where, Has My Little Dog Gone? Rival companies hinted that a competitor’s boats were inferior and dangerous and that bunks in their staterooms were “about the dimensions of a poor-house coffin”. 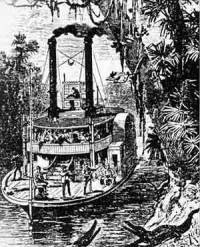 Riverboats steamed roundtrip between Jacksonville and Sanford twice weekly. Armed crewmen perched on the bow to shoot at alligators to keep the reptiles from tangling in the paddlewheel. The furnaces of the boats consumed vast amounts of wood. Crews replenished the wood bunkers from caches along the shore twice daily. Clouds of smoke marked the progress of the boats around the curves of the river. The riverboat City Of Sanford, a vessel of 145 tons, was built in Jacksonville by the Thompson & Chase Shipyard; she was launched on November 24, 1880. Only one week before the ship met disaster, the Florida State Supervisor of Steamboat Inspectors had examined the ship and passed it as meeting all safety standards. In the two years she was in operation, the City of Sanford had made 137 trips between Sanford and Jacksonville. On the night of the wreck the Sanford departed from Palatka at 10 p.m. on a Sunday carrying 21 crewmen, 11 salon passengers, and an uncounted number of deck passengers. She carried so much cargo that sacks of cabbages had to be piled on deck and lashed to the railings. Midway down the river, at Georgetown, the crew had packed the bunkers with fat pine logs oozing turpentine. The captain and most of the crew went to bed leaving a watchman, H.B. Means, in charge. About 3:30 a.m., as the City Of Sanford cruised 150 yards off shore, Means saw a tongue of flame flash in the fuel bunker. He ran for the captain, awoke passengers, and spread the alarm. Chief engineer F.E. Smith ran for the ship’s water pump. “When I got there, the flames were about six feet high extending above the boilers. I judged that the flames were about two feet from the hose and injector. I then made up my mind that the boat would burn in spite of everything as the fire had gained such rapid headway… I do not think it was more than eight minutes from the time the fire started,” Smith said at the inquest. Curtains and carpets in the saloon ignited. Paint blistered on the woodwork. Trails of flame raced up the rope rigging. The fire enveloped the ship less than 15 minutes after it was first spotted. A witness on shore said it looked as though “a match had been put to a stack of dry hay”! Pulling on his pantaloons, the captain rushed to the pilot house. Seeing the extent of the fire, he steered hard right, hoping to beach the vessel so that people could escape in shallow water. “I climbed to the hurricane deck where the pilot house is,” Captain Roberts said, “I headed her for the shore just as quick as it could be done and I ran her at full speed trying to beach her so high that she couldn’t swing around and drift off. The tide was flooding and the wind was with the tide”. The flaming Sanford grounded in three feet of water about 60 feet from dry land. “I did not ring to stop the engines and they were kept running purposely to keep the steamer against the bank,” Captain Roberts said. “If the engines had stopped she would undoubtedly have sung off into the river”. The impact of the ship’s grounding threw some of the people on deck overboard. Others stayed on deck and burned. When flames engulfed the pilot house the captain raced to a cabin occupied by Mrs. Annie Keep and her eight-year-old son, Brandon. “I took them aft,” said Captain Roberts, “And getting there found two other lady passengers. I told them to jump overboard as the water was shoal and the boat aground. One of the ladies, a Miss Ireland, then jumped overboard. But I saw she would get sucked under the wheel and jumped over after her telling the others to follow me”. The other women refused to jump. Captain Roberts waded ashore carrying Miss. Ireland, whose hands and face were burned and all her hair singed off. Then he waded back to the Sanford. “When I got to the place where I had left the ladies and children (it) was in a blaze and they had disappeared. I never saw them again”. Miss. Ireland’s father, mother and sister were also on board the Sanford. Her father later said that when they left their stateroom, “ We were met by a wall of flame which seemed to enclose us completely. My little one darted back in the flames again followed by my wife – the last I saw of either of them”. Mr. Ireland stayed searching for his family until his whiskers caught fire. When he jumped overboard, the churning paddlewheel caught his foot and jerked him upside down before dropping him in the river. W. A. Brooks traveled with his young son and his 16-year-old nephew. The blare of the ship’s whistle woke them and they ran on deck. “Immediately as the boat touched land,” Brooks said, “I handed my boy down to my nephew on the saloon deck. I said, ‘Here, Pete, take him and get overboard!’ He replied, ‘All right, Uncle Bill, I’ve got him’. And he jumped overboard with my boy”. Then Brooks leaped into the water. “The current and the wheel water was so strong I thought I would be swept out… I’m certain I was the last man on the boat. I did not find my little boy”. The huge paddlewheel, which had propelled the boat, kept turning; it now dredged up mud from the river bottom. “I’d kept the engine working to hold her to the bank,” Roberts said at the inquest. “The fore part of the boat was afire before she struck the shore. She was head on, but the wind sheered her around”. During the cruise the boiler pressure had been 85 pounds. In the run for shore the captain increased it to 110 pounds; but when the ship grounded, the heat of its burning intensified the heat of the furnace so that the pressure increased to 200 pounds – the paddle blades turned faster than ever before. When people jumped into the shallow water, the wheel’s suction drew them back into the churning blades or thrust them past the stern into deep water. Another steamer, the Charles M. Bird, rushed to the burning wreck and launched lifeboats to pluck survivors out of the water. H.L. Cable, purser of the Bird, said, “She was a sheet of flame from stem to stern… The upper works of the Sanford seemed to callapse (sic) and fell in and the smoke stack went overboard with a tremendunus (sic) crash… The piercing cries of the people in the water were heard calling, ‘Help! For God’s sake. Come’. At one moment the gurgling cry of a drowning man was distinctly heard”. One man swam to a lifeboat clutching his large traveling bag as he tried to save his possessions. Rescuers found he was naked and urged him to dress because of the ladies passengers. But when he opened his bag he realized that he’d unpacked in his stateroom; his bag was empty except for one collar button and a pair of socks! Residents on shore, awakened by the bells and whistle of the wounded craft as she rushed toward the bank, waded out to help survivors stagger ashore. Finally the churning wheel itself caught fire. The paddles ignited as they emerged from the water, blazed in a half circle, then hissed into the water on the other side. 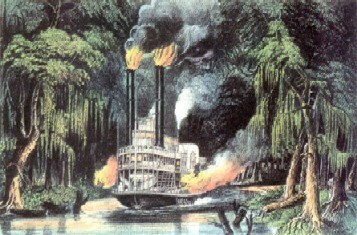 Fire chewed through the hull and water gushed in, setting off a white-hot shower of steam, sparks and popping cinders. “The passengers,” said one riverboat captain named Forester at the later inquest, “were terrified at the sight of that wheel revolving and lashing the water into foam. And the sight of Mrs. Ireland and other people being pounded to death kept them from making the leap which might have saved them. … Everyone of them might have been saved but for that wheel”. The Charles M. Bird brought the survivors the remaining few miles to Jacksonville. As the news spread a flotilla of small craft raced from the city to comb the river around the wreck for bodies. With a sensitivity for which news media are still famous, the April 24, 1882, Daily Times reported, “The body of Mrs. Keep, with the head burned off, has been removed from the wreck. Her little boy was burned to ashes… The poor charred remains of Mrs. Keep, Mrs. Ireland and their two children were found just about amidships…. Towards evening other parts of bodies were taken from the wreck, but whether they were portions of the bodies of Mrs. Ireland and the children were not determined”. “It was identified … by bits of the half consumed clothing still sticking to the charred trunk and thighs.. The newspaper continued, “An examination of one of the supposed human bodies found in the wreck Tuesday evening has proven to be a saddle of venison. It will not be given a Christian burial”. Looters took to their boats looking for plunder; they salvaged thousands of cabbages floating near the wreck. But the newspaper warned, “If any of those cabbages are put upon the market, there will probably be another victim to bury – the victim of an outraged community”! While authorities were able to identify nine bodies, the revolving paddlewheel had so mangled and minced the people it caught that no one was ever sure how many people had died in the wreck. “I saw, lying under the bluff, a great black hulk with broken rods and steam machinery heaped red and ruined in the center of the wreck,” he wrote. “As the most conspicuous feature of the dismal wreck stood the wheel, the great guilty ally of the fire, which, like a wheel of fate, had whirled down to death the flying fugitives from the flames”. Riverboat Captain A.L. Rice agreed: he said, “If that wheel had been stopped, there would not have been a life lost… It was the water wheel that did it”. For an overview of Northeast Florida riverboats click on Paddlewheelers on the St. John’s by Virginia M. Cowart.